Since starting medical school a year ago, this website has become relatively silent. I’ve struggled with finding enough time to write for myself and for this blog. I’ve intentionally avoided reflecting on what it’s like to be a medical student here, because there’s just so much to say and so much that I’m still trying to figure out for myself. The American College of Physicians’ Internal Medicine Newsletter for Medical Students (ACP’s IMpact) asked current medical students “What’s Your Top Ten?,” which prompted me to take a step back and distill all that I’ve learned into a list with words of advice for incoming medical students. Although I’ll admit I wrote this list largely for myself, I hoped that it may also be of use to others going through this journey into medicine. Here it is! I’d love to hear your thoughts. After my last examination as a first-year medical student, I couldn’t resist this opportunity to write about all that I’ve learned beyond the science and clinical practice of medicine. Medical school is a learning experience unlike any other—and I know that I’m just beginning to scrape the surface—but the first year really is an adjustment for everyone. I’ve thought a lot throughout the past 10 months about how much I have changed as a person, for better and for worse. Although this list is specifically for first-year medical students, I believe many of these tips will sustain me throughout the rest of medical school. My hope is that they may do the same for you. 1. Learn from those around you. In medical school, you find yourself surrounded by people you can learn from: your classmates, who have all done extraordinary things and pursued unique passions to be here by your side; your professors, who have a wealth of information that they want to share with you and not enough time to do so; and your mentors, who are eager to impart their wisdom and support you personally and professionally in your journey into medicine. 2. Practice what you preach. This isn’t easy, not in medical school nor in a lifelong practice of medicine. Physicians have alarmingly high rates of depression and one of the highest rates of suicide (1). Only 50% exercise weekly, and many physicians struggle with being overweight (2). If we expect it of our patients, it is only fair that we make an effort to embrace the healthy lifestyles that we encourage. This may seem counterintuitive to the fast-paced world in which we live, but I believe it’s more efficient to focus entirely on one thing at a time. Try turning off your phone while studying or closing your laptop in class. Make an effort to be mindful and to stay focused on the task at hand despite all the other thoughts that may be running through your mind. Experiment with studying in silence. Our patients will come to us to share personal and intimate details about their bodies and their lives—the very least that we can do for them is to be fully present in each moment of our time with them. The art of immersing oneself in a moment comes from being attentive and listening with both your mind and your body; it’s something we should strive to practice as a physician, a student, and a human being. 5. Understand that time is of the essence. I’ve found that in medical school, I’ve become acutely aware of time like never before. You learn what it really means to make the most of every minute of the day: flipping through flashcards in the few minutes before class, squeezing in a workout just before the gym closes, or talking on the telephone with friends on your walk home. When you are flooded by information in medical school you may feel pressure to rush through all aspects of your life. Instead of caving to this pressure to rush through everything; try to identify ways to work more efficiently and use your newly found time to slow down and recharge your batteries. Whether it be journaling, meditating, or talking to a close friend about the whirlwind of emotions that you feel throughout medical school, take time to reflect on your experiences. One study found that 53% of medical students had burnout (3); just as a career in medicine can be emotionally draining, so, too, can its training. Reflection in some form will help you put these experiences in perspective and come to terms with the sometimes-exhausting nature of medicine. 7. Hold on to what you know. Everyone comes to medical school with some idea of who they are and the kind of person they want to be in their career, whether or not you know what kind of physician that may be. Take the time to hold on to what you know, pursue what you are already passionate about, and do the things that you enjoy. Maintain and even strengthen the support system that you already have of family, friends, and loved ones. 8. Explore what you don’t. Nevertheless, medical school will no doubt change you. Make the most of this inevitable transformation—embrace it. While holding on to what you know, make space for trying new activities, for learning about what you may never have heard about. Be open to new relationships with the people around you, who are all facing somewhat similar experiences. Let yourself be malleable. 9. Have faith in the system. There’s no doubt that medical school is stressful. There is an infinite amount of knowledge to acquire, and medicine is an ever-growing field that never ceases to challenge our thinking minds. Sometimes, it can be overwhelming. It can be a daunting task to think about the sheer amount of knowledge that there is to remember. But, in the end, rest assured that this is all part of the journey. 10. Remember, practicing medicine is a privilege. Amidst all that happens in medical school, it can sometimes be easy to forget just what a privilege it is to be a physician. The opportunity to gain this wealth of knowledge about the human body and to study medicine, to devote a lifetime to its practice, is an honor. Being there for people at their most vulnerable is a humbling experience; medicine is gratifying to those who strive to make it so. The first year of medical school is a time to grow not only in your knowledge but also in your own identity. I know that I’ve taken only the first steps into the field and that there is so much more for me to learn, but, for now, these realizations are enough. I look forward to carrying them forward with me throughout the rest of my journey. Perhaps it was the ambience of a brightly lit conference room overlooking downtown Ann Arbor. Maybe it was the audience of pediatrics residents at C.S. Mott Children’s Hospital, doctors devoting their lives to caring for children. Or it may have been this event’s focus on teens sharing their own advice for doctors based on their personal experiences. Whatever it was, something was very different about the Pediatrics Noon Conference that I led about the Chronicling Childhood Cancer book project from last year’s Literati book reading/signing event. A couple months ago, I learned that residents hardly have an opportunity to interact with pediatric patients and their families outside of clinic visits. I was surprised–while medical school is peppered with patient presentations and opportunities to learn more from patients about their experiences, it seems as though these opportunities drop off in residency since residents have patients of their own. That was unsettling to me, though. Especially with pediatric patients, I think that giving teens and young adults the chance to share their own experiences and perspectives can be invaluable, both for these youth as well as for people who are devoting their lives to caring for these individuals. It’s also a reminder of what it means to embrace PFCC, or patient- and family-centered care: the recognition that we as clinicians must view our patients as partners in their healthcare, and in doing so, acknowledge how much we can learn from our patients. Events such as these demonstrate that there are an infinite number of ways that we can improve and better care for our patients by hearing what they have to say. At this event, I gave a brief overview of the research project before turning it over to three of the young authors themselves. Each individual shared some of their personal experiences and advice for doctors about just how much of an impact their interactions can have on patients. While the discussion was centered largely on the teens, their parents also contributed some insight. Overall, this was a change from the typical noon conference lecture, and it sounds like many appreciated what this unique noon conference had to offer. I was more anxious preparing for this event than I have been in a while, and I think it’s because I’m more aware of how precious time in medical education can be. I know how much people fight over this time to make an impression on doctors in the making. It truly is incredible to me that I have had this opportunity; it’s crazy to think that I have been a part of their education, that I may have been able to influence the kind of physician that some of these residents may be with their patients. One of the highlights for me was the very end. A number of people had to leave immediately since the event concluded right at 1pm, but I was amazed by how many people still chose to stick around and speak at length with each of these patients and their families. That meant so much to me, and I know that it meant a lot to the young authors. Instead of just getting their books signed and leaving, these residents took the time to connect with the teens and their parents. In the end, I know that this was the point of it all: to give residents a chance to get to know and learn from teens with cancer in a different way, and to make space for teens to share their personal experiences. If you walk through the infusion clinic at Mott Children’s Hospital, you’ll notice a lot of patients have one thing in their hands: iPads! That’s why I’m excited to announce that Chronicling Childhood Cancer has now been released as an iBook, available for download on any iPad or Mac laptop. With how widespread iPads are becoming for patients these days, I hope that these new version of the book will be more accessible and able to reach a broader audience. At the very least, I want this book to be available to patients and their families waiting in hospitals who may be interested in perusing it. And as always, all proceeds are donated: 50% benefitting the Block Out Cancer campaign for pediatric cancer research at the University of Michigan, and 50% benefitting the Child and Family Life Program at C.S. Mott Children’s Hospital. It continues to amaze me how much this project just keeps on growing. A special thanks to Learning Design and Publishing at the University of Michigan Medical School for making this all happen, from the hard copy to the electronic version. I can’t wait to see what’s next! With my White Coat Ceremony over and the start of medical school looming in the very near future, it seems inevitable to me that this website will be transformed, just as I will. While I’m not certain exactly how, I have several ideas about where I hope to go. 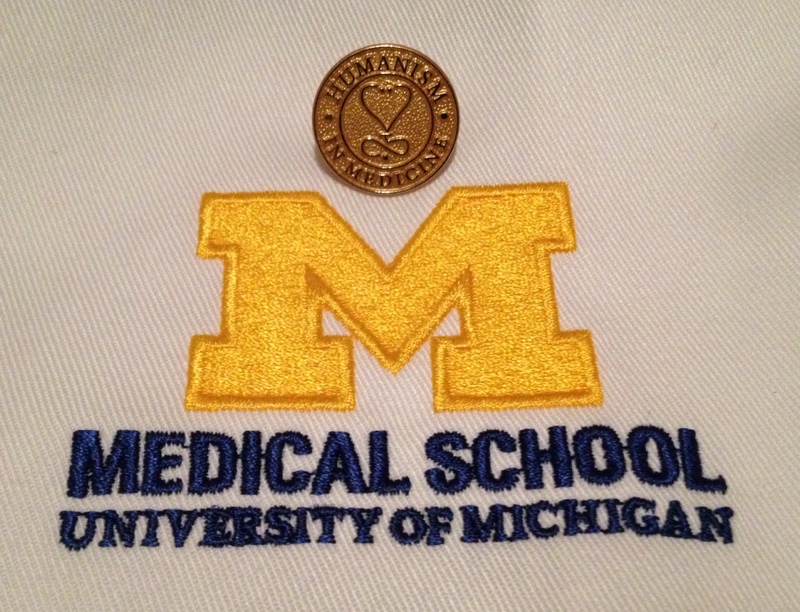 The stethoscope presented to us at our White Coat Ceremony reminded me of my original purpose in creating this blog. The stethoscope embodies, both literally and figuratively, one of my favorite components of the practice of medicine: the ability to listen. When I first discovered the genre of illness narratives, I felt compelled to listen keenly to the experiences of those with illness and the variety of ways in which they can be expressed. But just as a stethoscope alone does not provide a diagnosis, I’ve come to realize that there is more to receiving these narratives than to listen. I write because I believe also in the value of sharing, of moving forward and doing something with what I learn through listening. As I move into this next phase of my life, I want to rededicate this website to its original purpose of receiving and sharing ideas about illness narratives. But I want to do so from an entirely different perspective: as a medical student studying to become a physician rather than an undergraduate with hopes to enter medicine. And by acknowledging how different these two realms are, I can begin to understand from within just how medicine acknowledges the narratives of the ill.
I’m sure that I will be busy scribbling lecture notes, reading and rereading textbooks, and dissecting the human body. But all the while, as I study the science of medicine, I plan to bear in mind the art of medicine. I hope to applaud but also question and even criticize the ways that we talk about illness and about people in the institution of medical education. In high school, all I wanted to do was get out of Ann Arbor. Never would I have ever imagined living here as a University of Michigan undergraduate, not to mention staying on for graduate school. With each life phase though, I have gotten to experience a new dimension of Ann Arbor; I’ve come to truly appreciate all that this city and these people have to offer. What I love about the University of Michigan is the passion and dedication within our community. I have had the pleasure of getting to know so many motivated and inspiring students, advisors, and professors. This is a community of individuals who are committed to encouraging passion, embracing innovation, and nurturing our curiosity as life-long learners. This place and these people have shaped me into the person that I am today. I look forward to continuing to work with familiar faces as well as meeting new people. Despite the change instigated by moving out and coming to college, there is one thing that has stayed constant as part of my life: volunteering at C.S. Mott Children’s Hospital. Mott is a place where I have spent more than 5 years, hundreds of hours, and even birthdays. Every Friday, security personnel greet me, health professionals say hi, and the man at the parking structure always thanks me genuinely for dedicating my time as a volunteer. Perhaps what I most value is that many patients and their families have come to recognize me just as I recognize them. It means so much to me that I have had the opportunity to get to know these individuals and develop these lasting relationships. When I catch up with these people, I am reminded of just how much these experiences have helped me to understand what it means to truly care for others. Mott is a place that I have filled with memories over the years, and I’ve realized that I’m not quite ready to leave it just yet. I’m not done, and it’s such an honor that I don’t have to be. Forever, go blue.